General Information: Black garlic is garlic that has been aged for one month in a special fermentation process under high heat, where it develops its darker color, softer texture, and sweeter taste. The flavor is a wonderfully complex mix of molasses-like richness and tangy garlic undertones. It has a tender, almost jelly-like texture with a consistency similar to a soft dried fruit. It is not a substitute for regular garlic but has its own distinct flavor. 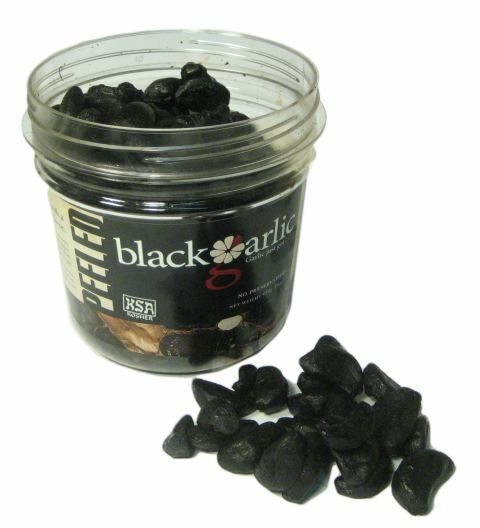 The black garlic has nearly twice as many antioxidants as raw garlic. It also contains the natural compound, S-Allycysteine.